The Prenup -- Lest we forget, a wedding is more than a simple celebration of the love between two people. It is also the occasion of the signing of legally binding documents. The Prenup is my illustration of the non-sentimental side of the marriage event. 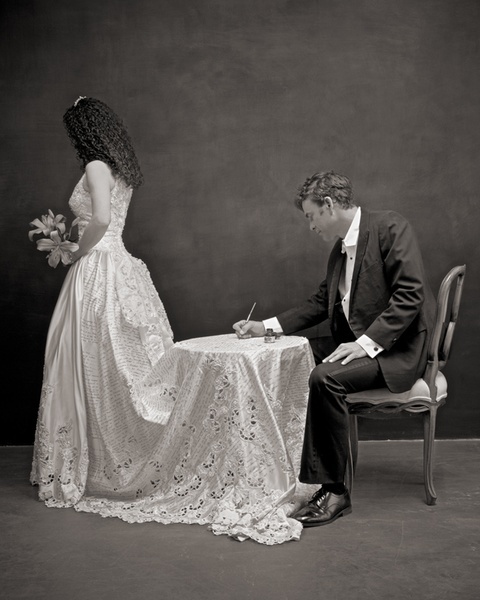 Ah, the dress, the flowers, the words of love… the daunting contract. In preparation for the making of this image I transcribed the entirety of my own pre-nuptual agreement on the dress and realized, to my dismay, that I had never truly read or understood the document. It was a sobering experience. This photograph is an cautionary tale. It is hard to read the fine print when one is so distracted by the opulence of the dress. 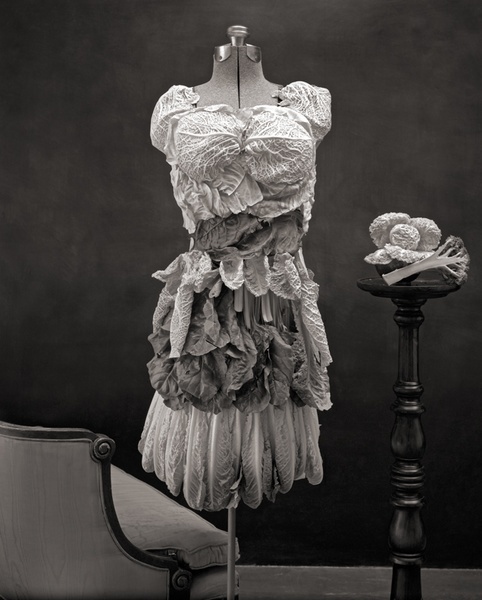 Cruciferous Couture -- Cabbage holds a place of significance in my life in all it’s visual frippery. It has become part of my personal iconography. I try to include cabbage in any body of work I create, but, really this picture is just about showing off my prowess with the hot glue gun. All that money spent on art school has to pay off somehow. The Empress’ New Clothes -- When given the theme 'The Dress' to work with, it was inevitable that I, being rebellious by nature, would create a picture in which no dress appears. The fairytale The Emperor’s New Clothes has long been a metaphor in my family for anything that reeks of inauthenticity or pulling the wool over the eyes of one’s audience. In the case of this image, no dress at all is the most beautiful dress of all. Beautiful work, Zoë! Thoughtful and thought provoking.